I can't tell you how excited I was to hear that Market Street was going to be offering Lodge Cookware as a part of their rewards program. (If you're not familiar, Lodge is one of the oldest makers of Cookware here in the States. They've been making quality products since 1896.) For so long I have been wanting to get a true Dutch Oven but the cost just wasn't something I could ever justify. But with the Market Street rewards program you can earn the products just by shopping at your favorite store. There are two different kinds of cookware available from Market Street through this promotion . . . 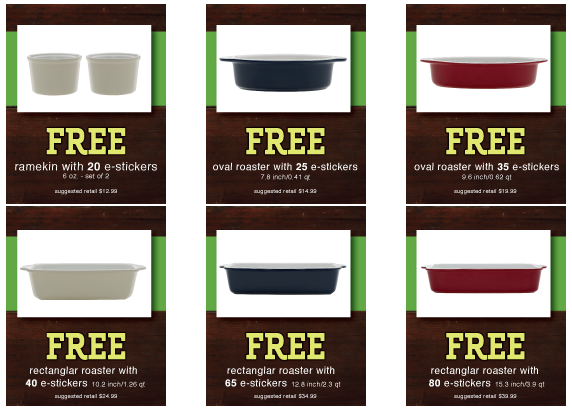 Note that the rectangular roasters are all slightly different in size and reward e-stickers. Please note the red is a bit larger than the white and blue dutch ovens and therefore requires a few additional rewards e-stickers. In order to accrue the rewards e-stickers for these items, you have to spend $10 in one transaction to get your first e-sticker, then you will get an additional e-sticker for every $10 you spend after that on the same ticket. The e-stickers will continue to be added to your account from now through January 6, 2015 which means you'll be able to keep adding to your rewards through all of the busy holiday grocery shopping. While you stop earning additional e-stickers on the 6th, you will still be able to redeem them until the 20th of January. Keeping up with how many e-stickers you have is quite easy. The total is listed on your receipt or you can use the MarketStreet app or the kiosks in the store to look it up. If you don't have a market Street rewards account, you will want to sign up for one right now before you spend another dollar that you aren't getting credit for - Sign Up Now. These would also make an incredible gift for the cooks in your life. And if you can earn them instead of pay for them how great would that be? It's all in the planning. Get started now. You'll be seeing my Lodge Cookware more in future posts when I start cooking holiday recipes with it. I'd love to know what you plan on making with yours! As a Market Street blogger I have an ongoing relationship with Market Street and post about them in return for perks and financial compensation.